Wilson Pickett was arguably the greatest male soul screamer of the 1960s and '70s. With a career spanning half a century, he sold millions of albums and tens of millions of singles, leaving a legacy of unforgettable hits, including "In the Midnight Hour," "Land of 1000 Dances," and "Mustang Sally." A first ballot inductee into the Rock & Roll Hall of Fame, Pickett collaborated with some of the biggest names in '60s and '70s pop, rock, and soul, and his passionate stage performances frequently garnered invasions by frenzied audience members of all colors eager to bask-and dance-in his radiant aura. A musician of rare instinct with an unmistakable intensity and charisma, the 'Wicked' Pickett was for many the living embodiment of soul. In the first biography of this legendary artist, veteran music journalist Tony Fletcher goes far beyond anecdote, weaving the turns of Pickett's extraordinary career into the larger story of black American music in the late 20th Century. As Fletcher shows, from his childhood in the gospel-rich cotton fields of Alabama to his early career in pre-Motown Detroit and long tenure at Atlantic Records, Wilson Pickett always positioned himself at the cutting edge of rhythm 'n' blues and soul. By the time he was thirty, Pickett had five #1 R&B hits, rubbed shoulders with the likes of James Brown, Otis Redding and the Who, and traveled to Ghana with Ike and Tina Turner, Santana and others to headline the first American popular music package to visit the continent. As with so many artists of his generation, the price of superstardom was a career punctuated by violence and drug abuse, with fits of erratic and wild behavior leading to a career slump and two jail terms in the late 1990s before a late career redemption. 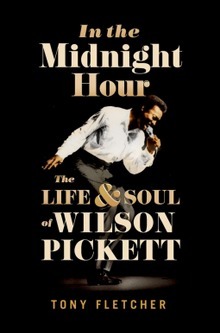 Drawn from extensive interviews with the singer's close family and friends and regular members of his studio and touring bands, In the Midnight Hour is a narrative portrait of one of the greatest voices of soul and a rare window into the social upheavals that surrounded him, the genre he helped shape along the way, and the pitfalls of the fame that success brought him.